created April 12, 2006, updated Sept 2009 with more info on data collection using the EIS. I'm constantly evaluating the performance of my airplane, so I can speak intelligently about the effect of various modifications that I've made throughout it's evolution (wing tips, gap seals, gear leg fairings, etc). The plot above came directly from my EIS (engine information system) during early testing, which feeds my laptop a constant stream of data at the rate of once per second. It's difficult to get much information out of a plot like the one above, other than general trends, especially on a long flight, but after importing the data into a spreadsheet, it can be easily analyzed later for an accurate look at the data that's been gathered. The green line above is altitude, the blue one RPM. The squiggly stuff is the result of a problem with my first EIS unit whereby the RPM and temperature readings were all driven crazy by high temperatures in the cockpit, but that was later fixed by a free replacement. The middle of the chart is five touch and goes. This kind of chart is not really very helpful when it comes to pure numbers, but the tabulated data is invaluable (see details near the bottom of the page), and you can see from the example that you can hold altitude pretty closely if you pay attention (see table below). With my 2700cc Corvair engine and Sensenich 54x58 prop, max speed on a standard day is 181 mph TAS (true airpseed, calibrated) at 2000' while turning 3400 rpm and burning 7.1 gallons per hour while properly leaned to stoichiometric. Static rpm is 2840 with this prop. 75% cruise is 166 mph TAS at 7500' (wide open) while turning 3220 rpm and burning 5.7 gallons per hour, which is 31 mpg. If I throttle back to 150 mph TAS and lean it out to "economy cruise", I can get 42 mpg. These numbers are from prop runs done on April 20, 2008, with wheel pants but no spinner. The spinner is only good for about 2 mph on my KR, at the most. Climb rate from 800'-7500' is 970 feet per minute, on average. With the 3100cc Corvair engine and Sensenich 54x58 prop, max speed on a standard day is 191 mph TAS, a 10 mph increase over the 2700cc engine. Climb rate is improved by about 200 ft/min, which is what you'd expect with the 20% power increase. 75% cruise speed with the 2700cc Corvair (wide open throttle at 7500' on a hot and humid day) was 160 mph with no wheel pants, GPS verified in four directions (averaged). Wheel pants added 12 mph to the top speed of the plane, now up to 188 mph TAS at 2500' with the 3100cc engine in the summertime, better in the winter. They helped the climb rate more than I'd imagined, and the engine now turns 90 rpm higher at wide open throttle. Empty weight of N56ML is 760 pounds, with CG in the middle of the range. Fuel burn moves the CG slightly more forward as fuel burns from full to empty. Normal flying weight with full fuel, laptop, flightbag, and me (150 lbs) is about 1000 pounds. Most of the testing is done close to full fuel. Wide open fuel consumption down low is about 9 gallons per hour with the 3100cc engine, 7.2 gallons per hour with the 2700cc engine, leaned for proper mixture (max RPM). On a flight to SNF with the 3100cc engine at 9500' throttled back to 3000 RPM, I got 120 IAS, which was about 148 mph TAS, while burning 3.5 gph leaned to peak. That's 42 miles per gallon! Running 100LL fuel allows me to lean even further, with improved fuel mileage. Touch-and-goes at a local airport average 2 minutes per circuit (calculated from 5 laps done in 10 minutes). Normal landing (touchdown) speed is in the mid 60's (mph) TAS with full flaps. Any slower than 60 mph will make the tail hit first, due to the short KR landing gear. Stall speed at about 1000 pounds with no power (idle) is about 58 mph TAS with flaps, and 64 mph TAS clean. Stall speed with power is somewhat lower. I have seen 50 mph TAS once at full throttle, but I wasn't brave enough to stall it at full throttle, although I'll bet I wasn't far from it at the time! As with all of these numbers, this will improve with gap seals, better wingtips, etc. Keep in mind that my wings are a foot shorter than most KR2S's, and I also intend to experiment with longer wingtips that function as fences. Best climb speed is about 90 mph IAS with the 2700cc engine, which got me about 1100' per minute between 1000-3000 feet with no wheel pants. Real "best climb" is probably even slower, but there's no point in climbing that steep because engine cooling suffers, as well as forward progress. Testing continues on that front. At 16,000', it's still climbing at well over 200 fpm. These numbers were gathered from the EIS's altitude recording function, divided out through time, so they are accurate, not just indicated climb rates. 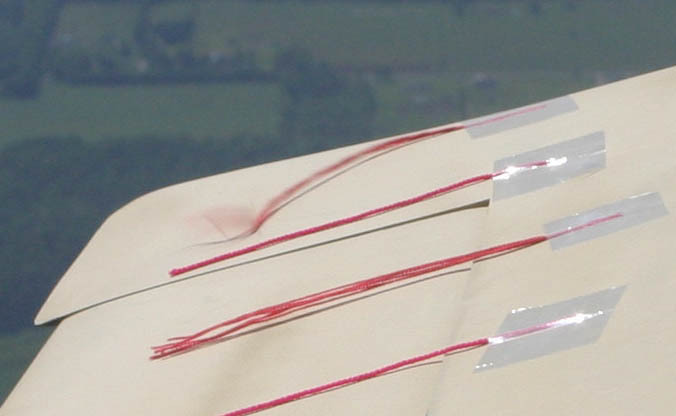 Best glide ratio is about 11.5:1 at 85 mph TAS (which is also IAS) and about 650 feet per minute. At 90 mph Indicated Airspeed, the GPS (4 way reading done twice) also reads exactly 90 mph. This is with the engine at idle. Having heard that a stopped prop would yield better glide than a "windmilling" prop, I did another test from 10,000' with the engine switched off. Glide rate was identical to the glide rate with the engine idling, so I guess "windmilling" means with no power. I usually try to fly cross-country at 10,000' (either 9,500' or 10,500'), so I can glide 25 miles if the engine croaks. And it's cool, clear, and glass smooth up there. Fuel consumption is considerably lower, and engine load is reduced substantially. Flying high is a no-brainer, if you can keep from falling asleep! Fuel consumption numbers are accurate. For almost 150 hours I've calibrated the EIS fuel totalizer (a Flowscan) to match reality. I topped it off and weighed the remainder of a 5 gallon can to get the final details. On the last 38.2 gallons that it said I burned, the actual number was 38.233 gallons. That's .009% accuracy, which is close enough for KR work! 1950 rpm is the minimum RPM that my plane will continue to levitate in level flight, and that's without flaps in the lower 80's. The fuselage is at a 10 degree angle in this configuration.Climbing out at 100 mph IAS wide open (3500 RPM), the fuselage angle is 8.1 degrees (the plane sits at 9.2 on the ground). At engine idle at 80 mph indicated airspeed (landing configuration), the fuselage is at a 6.8 degree angle with flaps down, 8.2 degrees with flaps up. At touchdown the way I normally land, fuselage angle is around 5.2 degrees. Wide open at 1500' at 172 mph true airspeed (before wheel pants), the fuselage was at a .5 degree angle (nose up). As of September 2010, I have 945 hours on the airframe. Above is a comparison I've made of four different props: a Sensenich 54x54, a Sterba 52x60 (repitched from 54x66), an Aymar Demuth 52x60, and a Tennessee Propellers 54 x 58, all while running the 2700cc engine. Conditions were as close as I can get to the same, and I think you'd agree I got pretty close. The biggest difference might be that I only had a spinner on the Sensenich, as it was too much trouble to make a spinner just to test the other three. The takeaway from the above chart is that the Sensenich is turning 560 rpm faster, and burning 7% more fuel than the Sterba, but only achieving 2 more mph (which the spinner will take care of). This testing was done before I had wheel pants, which is about a 12 mph penalty. This test was done in May of 2008 running the 2700cc engine to compare a Sensenich 54x58 prop with a Sterba 52x60 (the same one I started flying with, and also tested above). Other tests made on this day proved that my TAS is within 1-2 mph of actual GPS speed, and that a spinner is good for about 1-2 mph improvement in speed. CHTs and EGT were averaged, and some columns were hidden to simplify the presentation. Also, I calculated climb speed over the 800'-7500 climb, as well as averaged it between 2000' to 4000' for each prop. Climb speed was held at 95 mph (despite what it says in the chart). Oil temp is a little high, but that's because of the steep climb. I normally climb out at about 120 mph, which keeps it cooler. I should point out that these aren't just a snapshot of best performance, these numbers are from a column of about 50 rows of identical numbers...speed is held to exactly the same number, altitude to within a 10' slice of air, and rpm doesn't change more than the 3 rpm resolution of the EIS...it shows exactly the same number for many seconds at a time. These are accurate numbers, is what I'm trying to say. But the chart doesn't tell it all. While taxiing out with the Sterba, I immediately noticed it required more throttle to get moving from a stop. Acceleration and climbout was slightly more sluggish than the Sensenich, but nothing noticeable by anybody than me. I did a fuel consumption test on the way to Oshkosh in 2008 running the 2700cc engine. I was flying at about 8500' and had the mixture set to the same setting in all cases (two bars showing on the air/fuel meter), which averaged around 1275F-1300F. I had to correct it for each run because mixture changes with throttle setting on the Ellison. That's a little lean of peak, but that's the way I run it at altitude. This data was taken at 56F degrees OAT and 29.98 inches of mercury barometer reading, burning mostly 100LL fuel (only because I'd refueled after leaving home). This info is pretty stable data collected from my EIS data during the flight, usually at least 30 seconds within 5' of the the same altitude (although not all are at exactly 8500'), during stable flight (no diving or climbing). You get the idea... my KR is not a bad way to travel these days! I guess I mention this because the September issue of Kitplanes showed the new Arion Lightning kitplane doing 25 mpg doing 170 mph TAS at 7500' burning 6.7 gph, and I can do 166 at 40 mpg at 8500' burning 4.5, but again, I'm running lean of peak. It uses a Jabiru 3300cc engine, and mine is a 2700cc Corvair, for a few more weeks, anyway. It supposedly takes off and lands quicker, so it must have more wing area. That and the nose gear probably explains a lot of the difference, but I don't know how a 3300cc engine can drink that much at 7500'. Here's an example of the tabulated data that comes out of the EIS, which I collect with the laptop that I always fly with. You can see that it stores one data point per second, and it's as rock steady as I can fly the plane. If you do the numbers on OAT (outside air temperature), IAS (indicated airspeed), barometric pressure, and indicated altitude, I was doing 151 mph True Airspeed while getting 40.8 miles per gallon. I've done better with more agressive leaning, but that ain't bad for just flying along. The data is saved as tab delimited text, and then it's an easy matter to import into Excel later. It's collected by using an executable called EISlog.exe, available for $10 (with free DB-9 serial connector) from Grand Rapids Technologies. Serial to USB converters also work, but I've found that when I use one of those with a hub (to connect XM-WX weather and GPS) things can get fouled up depending on which device snags what COM port first. It's very dependent on what you kick off first, and sometimes it's still hosed, so my most recent laptop purchase had a serial port, and I'm thoroughly pleased by the cooperation between USB and serial device now. By its nature though, you have to remember to save the file and rename it after the flight. If the laptop craps out before you save it (like halfway through the flight), you lose the information. That's why I save the info a few times during the course of a long flight, just in case I forgot to plug it in or something. I use a $20 115V inverter that's wired to a breaker and mounted under the panel to provide laptop power, although a 12V converter could be used in the "cigarette lighter" if my laptop didn't require 19 volts! I've posted an example of one of these files, in both raw space-delimited text, a html version of the spreadsheet (although it's missing the colored fields that make it easy to see where the measurements came from, and the Excel spreadsheet (preferred if you have Excel). This was a prop comparison run that I made between my usual Sensenich 54x58 propeller and a Sterba 56x56 propeller. Both runs are in the same file, because I never switched off the EIS while swapping props. The Sensenich prop was first. Note that the data is serial, so in the text file the last data point appears first. In the Excel file I've flipped the data so the first is at the top, but in the text file the end of the flight is at the top. This is easily done in Excel by inserting a column A that is nothing but a series of numbers, then using that column to invert the whole file, then deleting that column. The Excel file is formatted and labeled, making it far easier to understand what I did and what the results were. The large areas of green and blue were used to calculate average climb rates, while the yellow areas are top speeds. The two runs were around my usual test points, 1500' and 7500'. 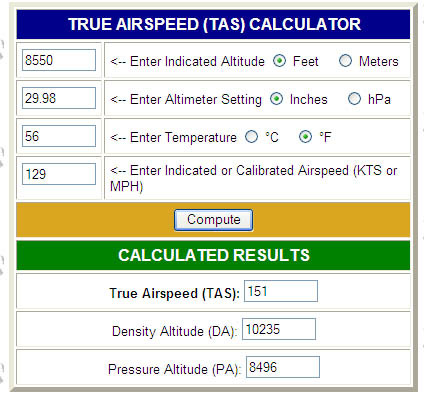 Since I'm a lazy scud, I just use this web-based True Airspeed Converter to do the dirty work.